Q: Do I need an account to use ARMSLIST? If you are a frequent user of ARMSLIST, you can create an account that will save you time performing repeated tasks. OpenID is a system that allows you to use a single login for a variety of different websites. OpenID works by allowing you to select a provider that you already have an account with, such as Google, AOL, or Yahoo. Login is transferred to the selected provider. The provider verifies your login information and control is transferred back to ARMSLIST. Q: How do I get a Premium Vendor account? Please head to Create an Account in the top right hand corner of the page. You will be prompted to select either a free (non-vendor), or Premium Vendor account. Choose Premium Vendor and head through the billing setup process. We will approve your account as soon as we've received your FFL or business license. Q: How much does a Premium Vendor account cost? A Premium Vendor account currently costs $30 per month or $300 for a one-year subscription. Q: I've created a Premium Vendor account. Why does it say "Free Account - Upgrade Pending"? We are still waiting to receive your FFL or business license. Please send it to us via our Contact Us page. We will activate your account as soon as we review it. Q: What features do I get as a Premium Vendor? Ability to create up to 500 listings. You are still required to abide by anti-spamming rules. Users can now search by “Dealers that Ship” to more easily find you! Direct access to our development team for questions, problems, or feature requests. Q: How do I create new listings as a Premium Vendor? After your premium subscription has been activated by our staff, you will need to create a vendor profile. There is a link on the account home page that will allow you to create your vendor profile. After you have created your vendor profile, new listings will automatically be created as "Premium Vendor" listings. Q: How do I upgrade existing listings to Premium Vendor listings? You must first create a vendor profile via the account home page. After you have a vendor profile, please contact our staff via the contact us page to have your existing listings upgraded. Please ensure you do not have security software or ad removal software running while browsing ARMSLIST. Software such as AdBlock may cause certain pages to fail to load correctly. If you are using Internet Explorer 6.0 please upgrade to a newer browser. If you have not gotten a response, the item has likely been sold. You can look for the item from another seller. 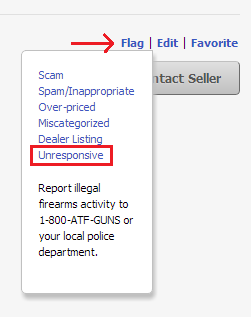 Additionally, you can flag the listing as unresponsive and it will eventually be removed from the site. Q: Dealers are overrunning the site, can you ban them? In short no, there are a number of features that enable you to filter out vendors. On the category selection page, there are links that allow you to view "private party" or "dealer" versions of the category. Additionally, on the category listings page, there are filters on the left side of the screen that allow you to toggle "private party", "vendor", or "all sellers". If you have old bookmarks, please save new ones with these filters applied appropriately. Please contact the seller directly. ARMSLIST does not get involved in transactions. Q: When I visit Armslist I get a popup and/or redirected to another site. Can you help? Notebook/Desktop: Run a virus scanner on your system. All of the major virus protection software vendors offer a free 30 day trial which will allow you to resolve the current issue and evaluate your virus scanning needs over the course of the month. Iphone/Android/Windows Phone/Tablet: Antivirus apps do exist for phone/tablet devices however the value of these apps is not clear at this time and it may be possible to simply clear your browser cache to rid your device of the problem software. Examples for some of the major mobile browser types follow; use a search engine to query for 'clear browser cache' and your specific device and browser type if your default browser is not mentioned. Keep in mind that the malicious software may actually be an app that you've installed recently, take an inventory of the apps and evaluate their safety. STEP 1: Login to http://customer.comcast.com with your Comcast email address and password. STEP 2: Click on Users and Preferences. STEP 3: Under Email Settings, next to Spam filter, click the Edit button*. * If you do not see an Edit button, you are probably logged in as a Restricted account. Your primary Comcast username is an Unrestricted account, and can make other sub-accounts Unrestricted. You can call 1-800-COMCAST to have them walk through making your account Unrestricted so you can change your Spam Filter settings. STEP 4: Click Disable Spam filter and click SAVE. Then click OK to confirm. Scroll to the very top of the page. To the right of the logo is a button that says "Create a Listing" as shown in the image. Alternatively, follow this link to create a listing. Enter your listing information. A confirmation email will be sent to the provided email address. Activate your listing by clicking the link in this confirmation email. Your listing will appear within a few minutes. Q: I have created a listing, but why didn't I get the confirmation email? Your confirmation email can be resent by clicking the "Edit" link on your listing page. Or you can access the Resend Confirmation page directly but you will need to enter the ID for your listing. Q: What is the correct category for my listing? The "Guns" classifieds section is for the sale, trade, or intended purchase of firearms, parts, and ammunition only. Posting items in this section that are NOT firearms, parts, or ammunition is in direct violation of these terms. The "Outdoors Gear" classifieds section is for the sale, trade, or intended purchase of outdoors equipment. Posting items that are NOT outdoors equipment is in direct violation of these terms. Items that are do not fit into "Guns" or "Outdoors Gear" that are for sale or trade in exchange for firearms should be posted in the "Other Items" section. Q: Can I post my listing in multiple locations? No. You should create the listing in the location where you and your item are physically located. Q: But what if I can ship my item? No, one location, and one location only. If someone finds it in their home location, they assume they can go to your location and make a deal. If they find it in a faraway location, they assume it must be shipped. Your listing will still be found through searches. There is also the option to select "Willing to Ship" when creating your listing. Browsers are then able to filter by "Dealers that Ship" when searching for an item. Q: Can I post in nearby states? No, this confuses people. If they want to look at an item in your location, they will browse your location, or find it through searching. Q: What about nearby cities? No, this also confuses people. Users look at listings in the cities where they live and shop. Q: Can I re-post my items for sale once per day until they sell? No, duplicate listings are not permitted. You can use the built in bump feature keep your listing new. Q: Ok so tell me clear and simple, how does this work? One item for sale = one listing, in one location. One item, one listing, one location, period. Play by the rules. Q: Can ARMSLIST help me conduct a transaction? ARMSLIST is purely a service provider that allow sellers to list items. As such, ARMSLIST can not and will not be a party in transactions. It is the sole responsibility of the buyer and seller to conduct safe and legal transactions. Q: Can ARMSLIST contact a seller for me or provide me with information about a user? Please contact your local sheriff's office and ATF branch office to learn how to conduct proper transfers in your area. Q: What is the safest way to conduct out-of-area transfers? ARMSLIST was designed for local interactions, please use the site accordingly. ARMSLIST is not involved in any transaction, we do not handle payments, guarantee transactions, provide escrow services, or offer "buyer protection" or "seller certification"
Q: Can ARMSLIST help if I've been scammed? Q: Can ARMSLIST provide me with more information about a scammer? Q: My listing was incorrectly flagged, can ARMSLIST reinstate it? Due to our policies, ARMSLIST cannot reinstate your listing. Please relist your item, it is a free site. Your privileges may have been removed as a result of your listings being repeatedly flagged. Spamming includes but is not limited to listings that do not pertain to the subject matter of the site (firearms and outdoors activities), posting the same material in more than one category, and posting the same material in more than one location. The site is designed to allow searching across local, state, the entire country. DO NOT create listings in more than one location. Your listing may be moved to a different category if several users flag it and move it to a new category. Q: Why was my non-firearm related item flagged? The users of this site control which items are removed. This site is intended for firearms, ammunition, and accessories. If your non-firearms related item is repeatedly flagged, please take it to a site that was designed for that type of item.